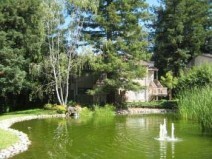 Luxury, executive Saratoga condo w/ultimate privacy nestled among redwood trees overlooking pond. Perfect for corporate/executive rental. Luxury, executive Saratoga condo. There aren’t any common walls in this top floor unit with a view of a bubbling pond tucked away in the redwood trees. A very private spot for the discriminating person. Oversized living room / dining room feature high cathedral ceilings and hardwood floors and built-in surround sound over wood burning fireplace. Flat screen tv included with furnished rental. Dining room has private patio overlooking water with no neighbors in site. Updated kitchen has water and ice on the door refrigerator, gas cooking and new built-in stainless oven with microwave combination. You can sit for hours and take in the views from the breakfast nook. You will feel as though you are on top of the world in your own tree house. Absolutely private master bedroom with soaring cathedral ceilings. Enjoy private evenings on private patio with climbing wisteria. Spacious master bedroom closet with organizers Tub and shower in attached bath. Spacious second bedroom. Hall bath is remodeled with walk-in shower. Double pane windows and sliding glass doors plus hardwood throughout. Comfortable year round with central heat and air conditioning. Indoor laundry just outside the bedrooms – very convenient. Single car garage with automatic opener. Plenty of guest parking close to unit. Beautifully maintained complex with lots trees and open grass area. Unit is close to large pool which has plenty of deck seating. Great location right off Highway 85 and Saratoga Avenue yet all you hear are birds singing! 12 month lease strongly preferred. $3500 per month fully furnished with high quality furnishings throughout $2500 per month unfurnished.